McDonell Electric, Inc. - We Bring Power To Your Projects! McDonell Electric, Inc. has been the go-to electrical contractor in the North Bay for dependable and reliable electrical installations, repair and maintenance for the winery and commercial beverage market since 2000. Eric McDonell, president of McDonell Electric, takes a hands-on approach to all of his projects from a simple energy audit to a crush pad or bottling line installation, Eric ensures that the work is done with a high degree of quality and the assurance that the work is done right the first time. McDonell Electric has extensive experience in the wine industry with multiple wine caves, crush pads, bottling lines and barrel buildings completed, few companies have the expertise to design, build, troubleshoot and maintain these complex systems and maintain the high degree of uptime demanded by the wine industry. Our commitment to the wine industry is second to none, with highly-qualified journeymen in well-stocked trucks to roll-out to your site, fully backed by a well-stocked warehouse in Sebastopol, you can be assured that when the crush is on, one call will solve your electrical needs, 24 hours a day, seven days a week - We Bring Power To Your Projects! Energy conservation has become an important process to help our customers save money. We understand that that if customers reduce energy consumption and implement energy reduction strategies, this will result in saving them money in the long run. McDonell Electric Inc. will evaluate various strategies in energy conservation to help our customers determine which process works best to meet individual business needs. By providing your business with emergency backup systems or generators is a critical function for your business. McDonell Electric Inc. understands that an interruption in power supply can result in a lost in data, power, and eventually money. By installing backups, generators, or Uninterruptible Power Supply (UPS) at you facility, you can ensure that your business is well protected from lost of information, power, and money. Troubleshooting is an important strategy to McDonell Electric Inc. when it comes to preventative and predictive maintenance. It is the key to identifying problems before they happen. McDonell Electric Inc. can help keep your business operating with no down time and avoid system problems that can become costly to your business. Emergencies can happen at anytime. Living in earthquake country we are not immune to the natural disasters that randomly hit our area. McDonell Electric Inc. is always available to its customers 24 hours a day, 7 days a week. Emergencies can result in power outages that could critically affect a business in many ways. McDonell Electric Inc. values its customers and is always on call when needed, emergency or not. To request an estimate or schedule a work order, please click here. McDonell Electric, Inc., and its solar division, MEI Renewables, Inc. recently completed a new solar shade structure with solar for St. Rose Catholic School in Santa Rosa, CA. The St. Rose campus, co-located with the prestigious Cardinal Newman High School in Santa Rosa, was significantly damaged in the Tubbs Wildfire in October 2017. Many of the structures, including the lunch structure were lost in the fire. McDonell Electric, Inc., MEI's parent company, was involved in the rebuilding effort. The general contractor for the rebuild, GMH Builders, Inc. selected MEI Renewables to replace the lunch structure with an eye toward also providing solar for the campus. The result was a raintight structure for the St. Rose students to eat their lunch and a new 32kW solar array that provides 52,000kWh of clean renewable energy, offsetting 65% of their usage! Contact McDonell Electric and MEI Renewables for an evaluation on how solar and solar + storage can help your facility save money! McDonell Electric is your one-stop shop for all your existing plant and expansion needs! We offer design-build services to get your expansion projects jump started ahead of the backlog and we have extensive experience in bottling lines, crush pads, barrel rooms, and tank farms. Our in-house industrial control panel shop can build or rebuild any fan control panel, night air controls, crush pad MCC or other control panel all UL certified. We also offer repairs of your existing plant, crush pad, and bottling lines. Ask how they can save you tens of thousands of dollars on your energy costs! Come see us at the North Coast Wine Industry Expo. Use our promo code for FREE trade show floor access! Register here. McDonell Electric is continuing new work at the Ray's Station facility in Hopland. Ray's Station, Mendocino County's largest wine bottling facility, has been expanding since last year and McDonell Electric has been a crucial part of those expansion efforts. McDonell Electric was chosen to design-build the electrical for their new 100,000 Sf cased-goods warehouse last year, and this year McDonell has broken ground on a new 4000-Amp service to power the facilities expansion plans through 2020. The Vintage Wine Estate-owned facility currently bottles 3.2 million cases of wine a year and is expected to increase this volume to well-over 4 million cases by next year. McDonell Electric has been selected to provide their design-build expertise on a number of projects in support of this expansion. If your facility is planning expansions, renovations, or repairs, and are looking for a design-build partner to help streamline the process, please contact Eric or Dennis to see how McDonell Electric can help Bring Power to Your Project! Paying Thousands Each Month to PG&E? SANTA ROSA, CA – Premium Wine Storage, a Santa Rosa-based bulk wine storage provider, flipped the switch on a new 131.4kW solar power plant at their Airport Boulevard facility. Santa Rosa-based electrical contractor McDonell Electric, Inc. was selected to design-build the rooftop solar array, financing was provided by American Ag Credit, also of Santa Rosa. "McDonell approached us about solar late last year and we wanted to see if the economics made sense," said Heath Dolan. "When we got the numbers and looked at the savings, it was hard to just let that go." The 131.4kW rooftop system, designed using Schletter racking, LG Solar modules, and Solectria inverters, will generate approximately 204,800 kilowatt hours of 100% green renewable energy offsetting almost all of their current usage. Call Dennis at 707-791-2003 and see how solar can make a difference at your facility! Premium Wine Storage Goes Solar! Proudly Serving The Wine Industry Throughout The North Bay! Since the Beginning, McDonell Electric has been a leader in serving the Wine Industry throughout the North Bay. Our roots are as deep as the vines themselves. Our commitment to serving the electrical and controls needs of our area's wineries is without measure. Whether your rebuilding, expanding, or just need maintenance, call McDonell Electric. Our in-house design-build capabilities will help fast-track your project so you can get it built and online faster. Call us to set up your facility for easy access to temp power, don't be left in the dark the next time grid power to down! McDonell Electric In The News! Great article in the North Bay Business Journal about Vintage Wine Estates' expansion at Ray's Station... Team McDonell provided the design-build electrical for the new 100,000Sf cased goods warehouse and is currently working on additional projects at the facility. With the new 2000A service installed last year, the new 100,000 warehouse, and more projects in the pipeline, McDonell Electric is your one-stop shop for your facility expansion plans. McDonell Electric was selected to replace a unit substation at Coppola's Virginia Dare Winery in Geyserville over the recent President's Day weekend. Originally designed as a transformer-only installation, with modifications to the existing gear, McDonell Electric presented a design-build option to replace the entire unit substation in-kind, which resulted in a cleaner installation and gave the winery all-new switchgear, replacing all the 40-year-old equipment with new modern switchgear. This is one example of how McDonell Electric's design-build team can work for you and help modernize your facility. Heath Dolan's successful Red Custom Crush has selected McDonell Electric as their design-build electrical partner on a new 387,000 gallon tank farm, to be built adjacent to their facility on Grove St. in Healdsburg. "McDonell handled the main electrical for our crush pad in 2014, so it made sense to bring them back for this next phase." Said Heath Dolan, owner of Red Custom Crush. The new tank farm, which will be open-air, will offer an additional 387,000 gallons of tankage for Red's growing client list. The new tank farm will also have provisions for two additional crush stations, additional chilling capacity and provisions for a mobile bottling line to be available. McDonell Electric has positioned itself to take on more design-build work and earlier this year made a strategic hire in bringing Peter Neumann on board as McDonell's senior electrical designer. "This year has really started off well with our design-build backlog." Said Eric McDonell. "You can expect to see a lot more of our design-build work moving forward." McDonell Electric, Inc. was founded in 2000 and has risen in the ranks to be one of the go-to electrical contractors serving the wine industry. Santa Rosa based electrical contractor, McDonell Electric, Inc., has completed a new 240kW ground-mounted array at Trentadue Winery in Geyserville, CA. The ground-mounted system, was designed in-house, with McDonell acting as EPC for the project. RBI Solar was tapped to install their racking system and install 800 ET Solar modules. The system was designed using SMA Tripower inverters and Also Energy for the monitoring. The array is sited on an underutilized area of land that was previously not in vines. "We're excited about this project, the cost savings for us, make this a good investment." Said Victor Trentadue. "We've been looking at solar for some time and McDonell Electric came to us last year with a proposal that made sense for us." The system will offset the energy needs of the Winery, Tasting Room, Event Center and several farmworker residences through PG&E's Net Energy Metering Aggregation (NEM-A) program. McDonell Electric, Inc. is a full-service commercial and industrial electrical contractor. They also provide Solar EPC and O&M services throughout the State of California. Go GREEN... It's not just a buzzword. Going green may seem like the latest trend, but there are a lot of benefits for business and individuals who participate in the green movement. Below are a few links that will provide information and tips to help you become more energy efficient. Check to see what Federal and/or State Tax Incentives are available this year. GEYSERVILLE, CA – McDonell Electric, Inc., has broken ground on a new 240kW ground-mounted solar array at Trentadue Winery. The array is sited on an underutilized area of land that was previously not in vines. "We're excited about this project, the cost savings for us, make this a good investment." Said Victor Trentadue. "We've been looking at solar for some time and McDonell Electric came to us earlier this year with a proposal that made sense for us." The McDonell Electric design and built system will offset the energy needs of the Winery, Tasting Room, Event Center and several farmworker residences through PG&E's Net Energy Metering Aggregation (NEM-A) program. McDonell Electric, Inc. is a full-service commercial and industrial electrical contractor, specializing in wineries. 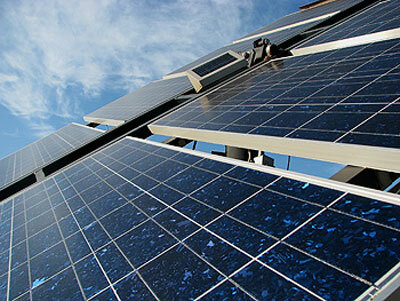 They also provide Solar EPC and O&M services throughout the Wine Country. McDonell Electric, Inc. to Install 756kW Solar Array! HOPLAND, CA – McDonell Electric, Inc. has been selected to install a new ground-mounted solar array at Vintage Wine Estates' Ray's Station facility in Hopland. The 756kW system was developed by REC Solar of San Luis Obispo and is expected to be completed by years' end. A new 2000A main service upgrade for the facility was designed, engineered and constructed by McDonell Electric, Inc. as part of this package. GEYSERVILLE, CA – McDonell Electric just completed the installation of a new dual-head electric vehicle (EV) charger at Trentadue Winery in Geyserville. "We're seeing a lot more of our guests driving electric vehicles and felt that installing a charger makes sense and allows our guests to charge their car while visiting the Winery." Said Cooper Henderson, Chief Operating Officer for Trentadue. Trentadue's EV charger is available free of charge for Trentadue guests and is compatible with all electric vehicles. Trentadue's decision to place an EV charger at their winery coincides with a planned solar project to be completed in early 2016. HEALDSBURG, CA – McDonell Electric just completed the installation of two electric vehicle (EV) chargers at Twomey Cellars' Westside Road facility in Healdsburg. The chargers, one Tesla-branded fast charger and one Clipper Creek level 2 universal charger were provided as part of Tesla Motors' new Destination Charging program. McDonell has a small backlog of these units to be installed in the Wine Country in the coming months. Locations of these chargers can be found atwww.teslamotors.com/destination-charging Wineries interested in learning more about Tesla's Destination Charging program can contact dennis [at] mcdonellelectric.com for information. McDonell Electric Completes Solar Installation at Honig Vineyard & Winery! RUTHERFORD, CA – McDonell Electric was selected by solar developer Bright Power, Inc. to construct a 188.46 kW expansion of Honig Vineyard & Winery's existing 163.8kW system. "With the expansion of our wine facility over the past few years, we more than doubled the size of our solar array (photovoltaic system) to meet our goal of being solar powered and sustainably operated." said Tony Benedetti, COO for Honig. Tired of Paying PG&E All Your Hard-Earned Money? McDonell Electric can solve your PG&E troubles with a new solar installation at your facility. All your neighbors have done it, why haven’t you? We offer a site analysis, a preliminary layout, analysis of your existing PG&E usage and a comprehensive proposal that includes financial performance so you know when the installation has paid for itself and you begin saving REAL money and we provide all of this for free! No budget for capital projects this year? We can refer you to lenders in the area that are solar-friendly and will lend money for your installation. And if your facility qualifies for a Power Purchase Agreement (PPA), we have PPA partners that will pay all the costs to build the system, usually for no money down and in exchange you will have a lower, normalized bill for a fixed period of time and when the contract is up (usually 20 years), you can purchase the asset at a much lower rate and it’s yours forever. Don’t forget the tax incentives! Your new installation will allow you to take advantage of the Investment Tax Credit (ITC), which allows you to take a full 30% of the cost of the installation off of your taxes, even in the very first year! Call Dennis at (707)829-9681 and see how McDonell Electric can help save you money. The Great Recession hit everyone in the North Bay hard. Did you defer maintenance on your solar system to cut costs and save money? Is your PG&E bill creeping up without explanation? It’s possible that your solar system could be having issues. If you’re lucky, a module washing may restore your energy savings, if not, you could have dropped a string, blown a fuse or have a fault on your inverter, any one of which would cause your system to produce less, robbing you of potential energy savings. Call today and let our experienced staff shake your system down and get your system back to its optimum production. We service all solar systems no matter how old the installation or who installed it. Using state of the art diagnostic tools, we can benchmark your system against what its production should be, troubleshoot any issues and repair most problems. Want to upgrade your system or have a new system installed? Call (707)829-9681 today for a free analysis of your current energy usage and let us tell you how solar can help trim your bottom line. HEALDSBURG – Red Custom Crush has selected McDonell Electric, Inc. as the electrical contractor for their new crush pad in Healdsburg. This new facility, on the site of the former Aaction Rents which burned down last February, will have a capacity of up to 6,000 tons per year and storage for over 1.1 million gallons. McDonell Electric’s scope of work includes a 1,200 amp main switchboard, all panelboards and electrical distribution, pump stations and a fan control panel in addition to all the lighting and power on the main floor and crush pad. Red Custom Crush will be operational in time for the 2014 Harvest. Well, it’s almost that time again…our fertile valleys will soon give up their bounty and before we know it the Harvest will be upon us again. Early summer is the perfect time for McDonell Electric to come by and perform a pre-harvest crush pad tune-up. This tune-up has been a real moneysaver for a lot of clients come harvest season. We will go through your crush pad with a fine-tooth comb, open all electrical cabinets, check all connections, perform thermal imaging to detect hot spots which are signs of electrical resistance, check all contactors, disconnects, fuses, etc. We will shakedown your crush pad from truck to tank and everywhere in between. When the crush is on, don’t let “it worked last time” be your excuse for why it doesn’t work now. Call (707)829-9681 and schedule a crush pad tune-up today! McDonell Electric, Inc. Announces UL 508A Certification!